January and February are Seagate’s two busiest months of the year in terms of sales, due to the ongoing cold and flu season. However, these winter months are a very quiet time for Seagate’s farming, fishing, and factory operations. It is also a time when even the local animals can be found resting and enjoying the sea breeze along the coast of Ensenada. 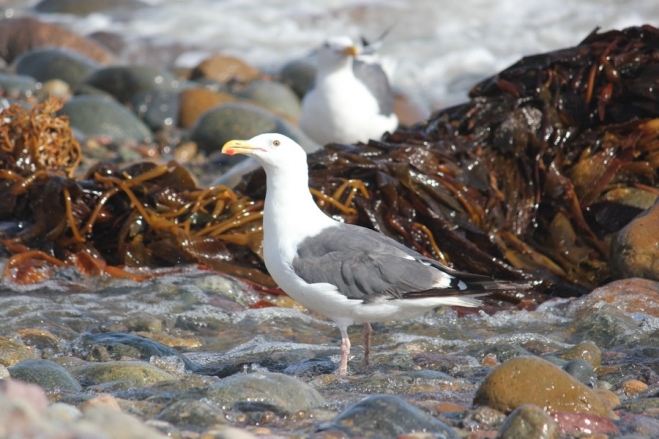 This seagull, standing next to a patch of giant kelp that washed ashore, is commonly known as the Western Gull (Larus Occidentalis) which is the dominant species along the San Diego and Ensenada coast. It is a coastal species that likes to nest on cliffs, pilings in bays, and even on the roofs of buildings. They are scavengers of opportunity, looking for fish already caught in nets, garbage, and road-kill. However they do perform an important function in nature by removing dead animals and scattered wastes from the landscape. The giant kelp next to the gull is the species that Seagate uses in the production of freeze-dried seaweed, except that ours is not hauled off from beaches. Divers cut and deliver the seaweed fresh to the factory year-round. 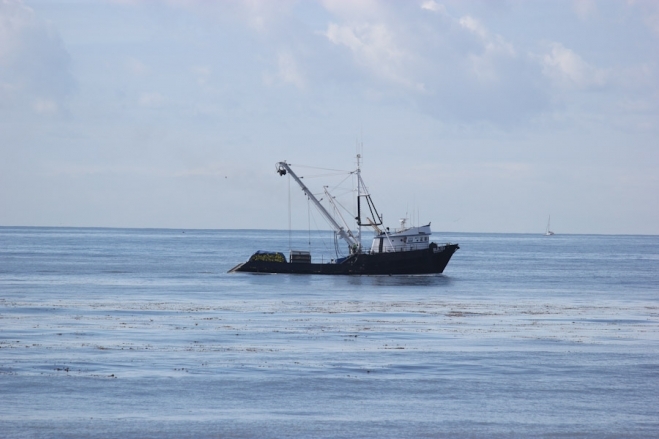 Typically found along the Ensenada coastline during this month are sardine purse-seine boats hunting for schools of sardines. 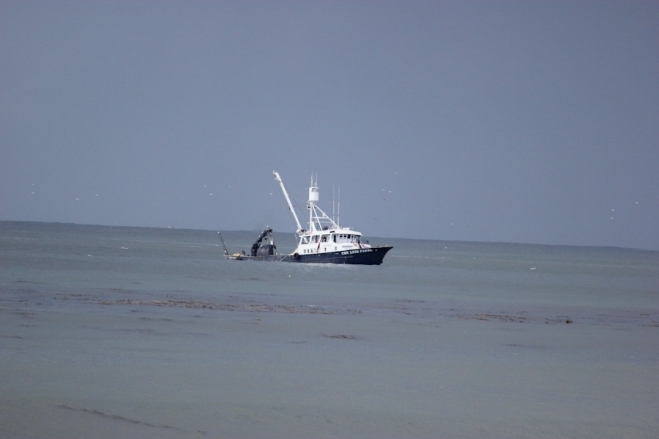 These boats can enjoy great success along this coastline because of the rich abundance of this species. However, they need to be careful because too much success means a very full boat that can easy be swamped by waves or capsize. Too many sardines in this boat? During these winter months, Seagate has few crops growing in the field. The artichokes pictured below continue growing from the same plants that were planted during the Spring of 2012. As long as we continue cutting the artichoke heads, new ones will grow in their place. While there is a 12-month growing season for Seagate in Northern Baja California, the colder weather does slow plant growth. Besides fishing boats, Ensenada has a fairly active container port. This cargo boat is on its way into Ensenada Bay at sunset. Seagate is waiting for delivery of a container of custom glass bottles that will arrive on a similar ship direct from China. This will finally allow us to begin filling our olive oil. This project has had many different delays, the latest being the shutdown of the Chinese factory for Chinese New Year. The fish picture of the week is taken at a reef along the coast of Belize. These warm clear waters have almost unlimited visibility. We look forward to seeing some seeing new photos to be taken by Richard in 2 weeks on a dive into sunken ships along the coast of San Diego …. if he can tolerate the cold, the currents, and the waves and still handle the camera. Too much warm-water diving has made it painful for him to return to the colder waters along Ensenada and San Diego. This is funny since he began his diving career in the Finger Lakes of Upstate New York, diving during the winter months, when it was necessary to cut through ice in order to enter the water.